I'm Shelf-ish: The Search by Titia Ellis Book Blast - Win a $25 Amazon Gift Card! 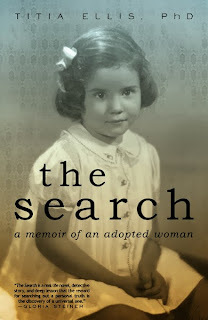 The Search by Titia Ellis Book Blast - Win a $25 Amazon Gift Card! As soon as she learns the story of her birth parents’ untimely deaths and her subsequent adoption, Titia realizes that her adoption is to be kept a secret—never to be discussed again out of fear of upsetting her mother. Wanting to be loved and to fit in, she obeys her parents’ wishes—until a mid-life crisis shatters her illusion of being the perfect daughter, wife, and mother. As Titia chronicles her poignant journey to find her birth mother, she details how she jeopardizes her relationship with her adoptive parents and threatens the privacy of unsuspecting strangers—all without any guarantee of a happy outcome. When Titia embarks on her quest to find her birth family, she immerses herself deep into her past, not knowing that what she discovers in the end will transform her entire life. Born in New York City, Titia Ellis was adopted and then raised outside of Chicago. Trained as a psychologist, she maintained a family therapy practice for many years. Titia and her husband, Bill, founded the All One Family Fund in 2008 to help children at risk. They live in Vermont and delight in visits with their three children and nine grandchildren. Pump Up Your Book and Titia Ellis are teaming up to give you a chance to win a $25 Amazon Gift Card! I really liked this effort of writing on such sensitive topic and I am sure parents and kids would like to find out more on such topics which are so touchy in nature. Good to read this review as it is very worth reading post.Its been so long I could not visit this site due to some very busy routine but it is really good experience after quite time. There is the search for the titia ellis book where you can also find more gift cards for your satisfaction and for the new hope. Maintain your life with check it and enjoy the new standards of your life here. I figure, we can dispose of stresses and challenges of life by utilizing web improvement as we can visit website make ourselves sprightly by watching most treasured things on cell phones and PCs. This is a great blog that you are managing. You share such a nice and interesting pieces that everytime I read it I get impressed. https://www.paraphrasegenerator.org/verbose-generator-make-your-paper-longer/I am a plant lover and maintain my own garden.